Welcome to The Compassionate Geek, bringing humanity into the world of technology. Thank you for requesting my free e-book version of The 5 Principles of IT Customer Service Success. Please enter your information, then a link will appear where you can download your free e-book. Free Bonus: Your ebook comes with eight email lessons to guide you through the book. Welcome to The Compassionate Geek, bringing humanity into the world of technology. 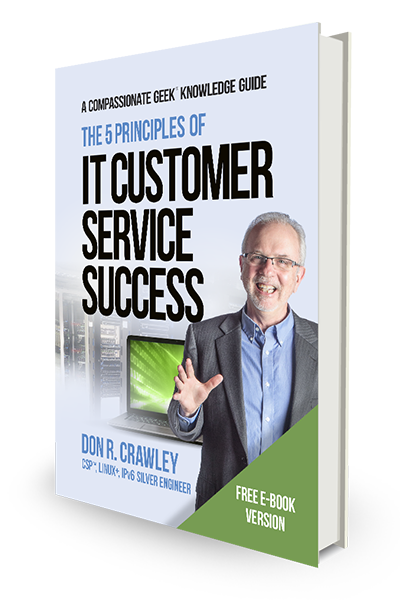 Thank you for requesting my free e-book version of The 5 Principles of IT Customer Service Success. Please enter your information, then you'll be redirected to a downloads page where you can download your free e-book. Check the box to receive my newsletter every other Wednesday with my latest thinking on IT customer service, communication, and how to work successfully with people.